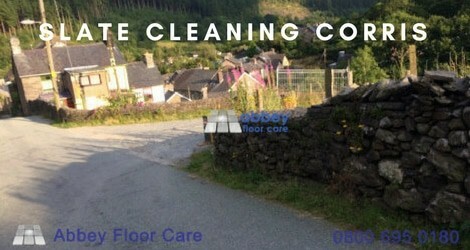 This slate cleaning Corris project was in a village in the south of Snowdonia in the Welsh county of Gwynedd. Several former slate mines penetrate the hillsides, and parts of what was once Braichgoch Quarry are open as a visitor centre. The house was built in the 1850’s and using slate from the local Corris’ mines for the walls and ground floors. The majority of the floor is the original slate, with only the fireplace and a small section of the kitchen floor extended with newer slate. As you can see from the photographs below, the slate has a variety of surface marks, consistent with the changes that have taken place over the life of the building. 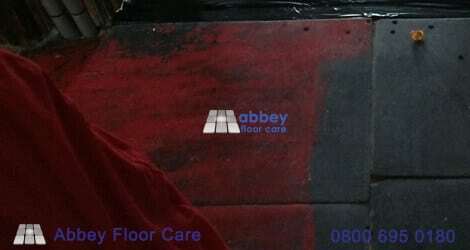 The photo above of the slate cleaning Corris work shows a large area of red cardinal wax residue in the hallway. There were small areas of red wax residues on all of the floors, indication that at one time the floors were a beautiful deep red waxed finish. 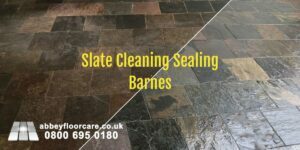 Our client wanted the slate floor cleaning back to the original finish and then sealing with a hard wearing, long-lasting sealer with a matt or mid-sheen finish. We started by applying a broad spectrum soil and coating stripper and left it for a couple of hours. The chemical is in the form of a thick gel to stop it drying out quickly, giving it time to soften any wax, paint and sealer residues. 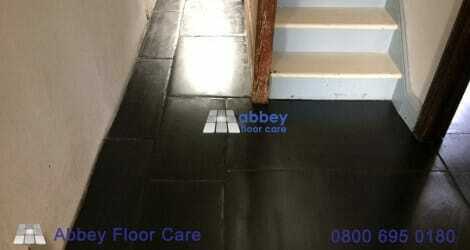 The photo above shows the gel stripper on the floor gradually softening old wax and sealer residues. 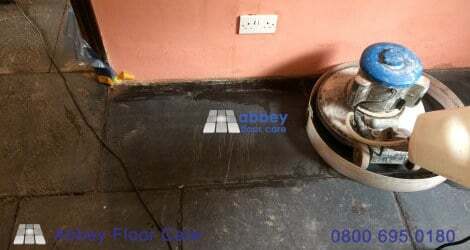 We cleaned the floor with a rotary scrubbing slate cleaning machine, using brushes and our gentle cleaning abrasives. The slurry was extracted directly into our van mounted solution tank. We had to use a scraper to remove thick deposits, including old candle wax. We didn’t have the time to remove the build-up of paint on the edges of the floors, so we removed the edge-paint mechanically with fine sanding tools. Once the floor was clean and dry, we could identify any areas of lost grout. We used a dark; Anthracite coloured grout to fill the voids. The photo above from our slate cleaning Corris shows the anthracite grout used to fill the small holes in the existing grout. We also used the grout to fill a few holes near the fireplace. We left the floor to dry overnight ready for sealing. 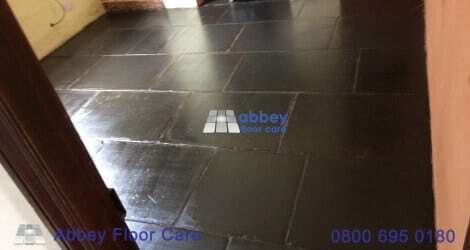 The natural colour of the slate in this area ranges from light grey to dark grey. The client wanted to enhance the colours to highlight the colour variations, so we used a colour enhancing sealer. 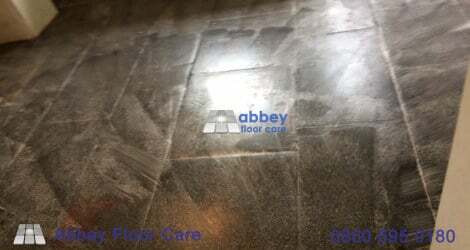 The photo above shows how we used a sealer that allowed us to create the ideal level of sheen for the client. 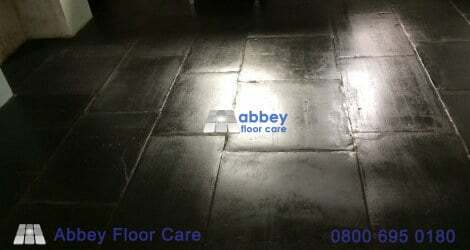 As you can see, the sealer enhances the colours in the slate and gives the slate floor a beautiful natural sheen. The photo above shows the kitchen floor. This area has lovely wear and tooling marks on the slate tiles. The foreground shows the wear from an old door opening that has been filled in to make the small extension. 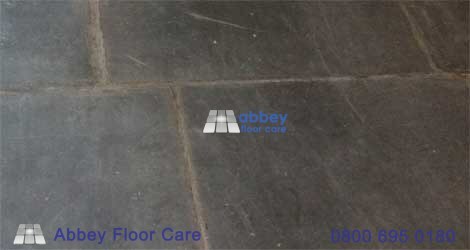 The centre of the photo shows different tool mark finishes on the old slate tiles. 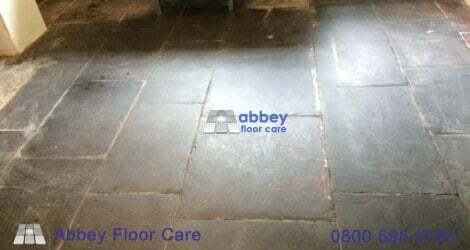 Our customer was delighted with our slate cleaning Corris work, especially as we managed to get the exact level of sheen they were hoping for. The sealer we used is hard wearing and makes the floor simple to keep clean. This sealer is also more resistant to attack from the variety of chemicals that can spill on the slate in a busy kitchen. 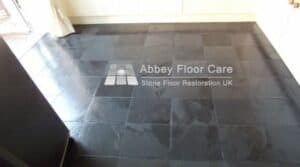 As with all stone floors, the key to keeping the finish is to dry sweep daily with a microfiber dry mop and damp mop regularly with an appropriate slate floor cleaner. 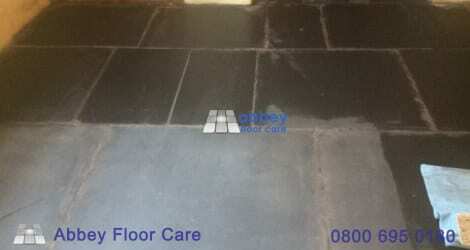 We gave our client a copy of our Stone Floor Care Guide and advice on the ideal cleaner to use. 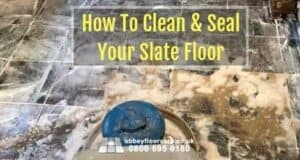 If you have slate floors that are looking tired and in need of restoration, please complete the simple contact form below for a free quotation. 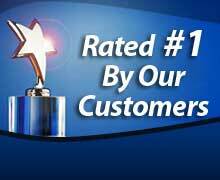 Please give the approximate sizes of your floors, the condition - (chips, scratches, marks, lippage, dirty grout) etc.